Actress, comedian and former talk show host Sherri Shepherd spoke to 60 female students from Southern Illinois University Edwardsville East St. Louis Charter High School (CHS) on Friday, Sept. 15. Shepherd was in St. Louis as part of her two-night appearance at the Helium Comedy Club, 1151 St. Louis Galleria St. She will perform at 7:30 p.m. and 10 p.m. Friday-Saturday, Sept. 15-16. “I want to talk to you all today about fear, and how you can press through it to accomplish some of your biggest dreams,” said Shepherd, Emmy Award winner and former cohost of The View. Shepherd had reoccurring roles on such sitcoms as Suddenly Susan, Everybody Loves Raymond and The Jamie Foxx Show. She performed on Dancing with the Stars, was the first black wicked stepmother in Rodgers and Hammerstein’s musical production of Cinderella and hosted The Newlywed Game show. Some films that she has starred in include “Think Like a Man, Act Like a Lady” and “Ride Along II.” Her book, PLAN D: How to Lose Weight and Beat Diabetes was a New York Times Best Seller. Shepherd is also a weekly radio host of the Tom Joyner Morning Show. The 5-foot-1 inch actress stood on stylish wedge sandals and told the young women about the feats she’s accomplished in show business, all while being unsure of herself, frightened of the task at hand and clueless of the opportunities it could mushroom into. Shepherd said she was a shy girl who grew up on the Southside of Chicago and enjoyed making people laugh. “People told me I was not pretty. I was too fat. I was snagged tooth,” she said. Shepherd asked her girlfriends if she should try her hand at comedy and got 10 affirmations and a single negative vote. She then started her journey to become a comedian. Along the way, she had several setbacks, but inspiration and drive kept her pushing forward. Shepherd received encouragement from such comedic personalities as D.L. Hughley, Chris Tucker, Jamie Foxx and Monique. “When you try things, you can be scared, But run toward the very thing that you fear,” she continued. “I’ve done that my whole life. If you work hard and stay focused, you can do what you want. 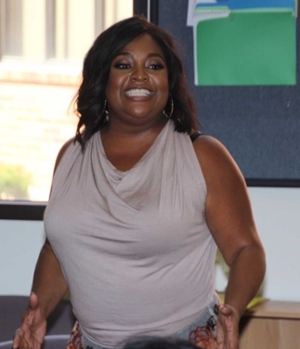 Actress, comedian and television personality Sherri Shepherd visited the SIUE East St. Louis Charter High School (CHS) on Friday, Sept. 15. 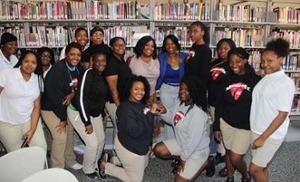 Sherri Shepherd, center left, and CHS Director Gina Jeffries, center right, are seen with Charter High School students.